OXFORD, Miss. – The School of Applied Sciences at the University of Mississippi has opened a new Office of Food and Nutrition Security at the South Oxford Center. Although David H. Holben, professor of nutrition and hospitality management, has been producing food security research at UM since he arrived in 2015, he and his students finally have devoted space to analyze data, conduct focus groups and interviews, and engage with community members. “My vision for the Office of Food and Nutrition Security at the University of Mississippi is to be the recognized leader in providing innovative solutions for food insecurity in Mississippi, the United States and the world,” said Holben, who has been studying the problem since 1997. Food insecurity is a lack of regular access to enough food to maintain an active, healthy lifestyle. According to the USDA’s 2017 estimates, some 15 million American households were food insecure. More than 13 percent of rural households reported food insecurity, much higher than those in metropolitan areas. Between 2015 and 2017, food insecurity in Mississippi was among the highest in the nation, at 17.2 percent. The university community is committed to helping solve this problem through its Flagship Constellations initiative, which seeks to find meaningful solutions through multidisciplinary response to health and social issues affecting Mississippi communities, the nation and the world. One of those constellations is Community Wellbeing, which works to find solutions to the challenges affecting rural communities to build stronger and more vibrant communities. Holben brings food security expertise and research from the Office of Food and Nutrition Security to this collaboration. Students and staff conducting research through the Office of Food and Nutrition Security have presented their findings at international conferences, including discussions of seven studies at the Academy of Nutrition and Dietetics’ annual conference in October. Doctoral student Prabhdeep Sandha, of Jalandhar City, India, earned the Mead Johnson Nutrition/Research Dietetic Practice Group Student Research Award at the conference for her study, “Impact of a Produce Intervention on Parental Produce Intake and Behaviors,” co-authored by fellow graduate student Michelle Weber, of Cincinnati. Undergraduate students also are gaining research skills through the new office. Katelyn Tarr, a junior dietetics and nutrition major from Pawnee, Illinois, presented a study on “Food insecurity and type 2 diabetes risk of adults with school children” at the conference, with funding from the first Undergraduate Travel Grant awarded by the UM Office of Research and Sponsored Programs. “Dr. Holben brought me in to learn how to write an abstract and make a poster for a conference, which is something that graduate students would normally do,” Tarr said. “It really helped me prepare for my post-graduate career. Five of the abstracts presented at conference stem from the Farm-to-YOUth! Project that Holben and his students have been working on since 2016, studying varying nutritional and educational interventions and their impact on food security in a rural Mississippi county. From produce tastings and take-home produce for elementary school children to summer nutrition education and feeding programs at the public library, the faculty-student team has examined different ways to improve food security for people living in rural areas. This fall, the office rolled out a new study in Calhoun County to examine food education interventions for high school athletes. Holben, along with an external consultant, develops the twice-weekly programming that includes a lesson, snack and educational handouts. 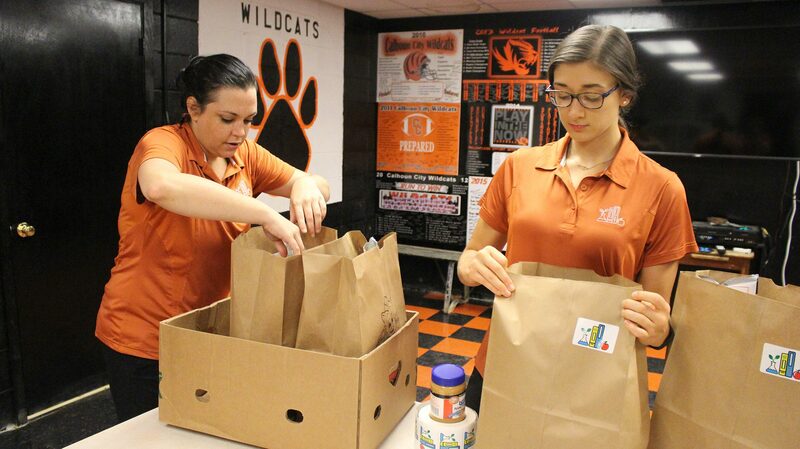 Graduate students Marta Dees, of Oxford, and Rebecca Henry, of The Plains, Virginia, teach the lessons and give each football player a take-home bag of fuel for the week, including peanut butter, yogurt, fresh fruit and granola bars, to implement the practices at home. “We’re primarily hoping to change the food environment at home,” Holben said. “They’re learning eight to 10 basic principles about food and nutrition that we’re helping them to implement through take-home food packages. Holben, lead author of the Academy of Nutrition and Dietetics’ most recent position paper on food insecurity in the United States, is elated with the opportunities that come with having an official office at the South Oxford Center. He looks forward to playing a significant role in fulfilling the university’s commitment to creating healthier, more vibrant communities. For more information about programs of study in nutrition at UM, visit http://nhm.olemiss.edu/.